Most of my weekends are filled with relaxation, reading, laundry, Thai food and roosters. Thankfully, there is the occasional weekend were a group of volunteers agree to meet in a designated city and celebrate our strange lives. In my 15 months as a volunteer, I have attended four official get togethers at three different Northeast Thailand cities: Khon Kaen, Surin and Ubon Ratchathani. Most of the time they’re organized by a few e-mails from a volunteer near the city. No hotel reservations need to be made, just a few words saying, “Let’s me up this weekend,” and anywhere from 15 to 35 Peace Corps volunteers show up at various times between Friday afternoon and Saturday morning. It’s our chance to compare stories from our respected communities. We talk of our students, co-workers, villagers and assorted reptiles crawling in our homes. These stories are best told over Western food (pizza or burgers) and Thai beer. We also tend to swap literature, movies and music. Our allowance is comparable to our neighbors in our villages, hence, we can’t go overboard spending baht on pizza and fancy hotel rooms so we tend to conserve the best we can. This sometimes means sharing a room with two to seven other volunteers. I’ve slept in a room with three other dudes, but I’ve seen eight ladies in one two-bed room. For a 500 baht room, that’s 62.5 baht per person, or about two dollars. But realize this is still a luxury as the rooms normally have air conditioning, a pressured shower and no mosquitoes – not things most of us have at home. It was only the first night of the weekend. On a three-day weekend, one night is normally dedicated to the entire group. All of us will cram into one restaurant or pub for a meal. After that evening, most volunteers break into their cliques. Me, I usually split off with Erin or the Jentlemen, also known as myself, Josh and Joe. A post-big-crowd afternoon with close friends. The beauty of these weekends in a big city is no one has to put on their volunteer face for their community. 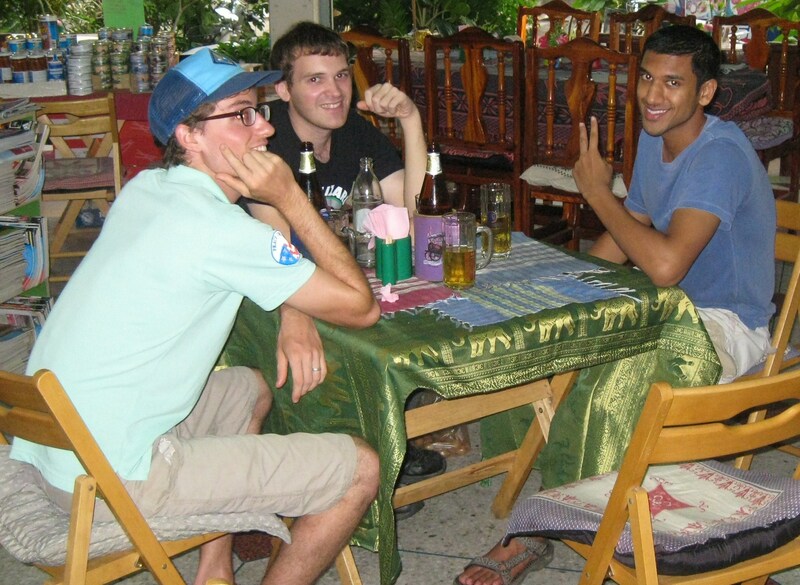 We don’t have to smile and look as though we enjoy being called a farang (foreigner). When a drunk approaches us on the street, we can act as if we don’t speak Thai. We tend to migrate towards restaurants geared towards Westerners, employing people who understand a little English. The volunteer weekends are the one time I feel I get my money out of the cost of the hotel as I spend a lot of time in it. Whether I’m with the Jentlemen or Erin, much time is spent in the air conditioning listening to music, playing cards or watching movies on a computer. In Ubon Ratchathani, another volunteer and I even went swimming at a pool. I’ve said this many times in prior blogs, but it can’t be said enough: little things like this are glorious to a volunteer who’s used to spending his weekend sweating and swatting gnats from his eyes while trying to read a book. Much of the weekend is spent away from the Thais, but Peace Corps volunteers do enjoy a good Thai market and most of the big cities have them. Chiang Mai and Bangkok have the best, but fun items can be found at the markets in Surin and Khon Kaen. 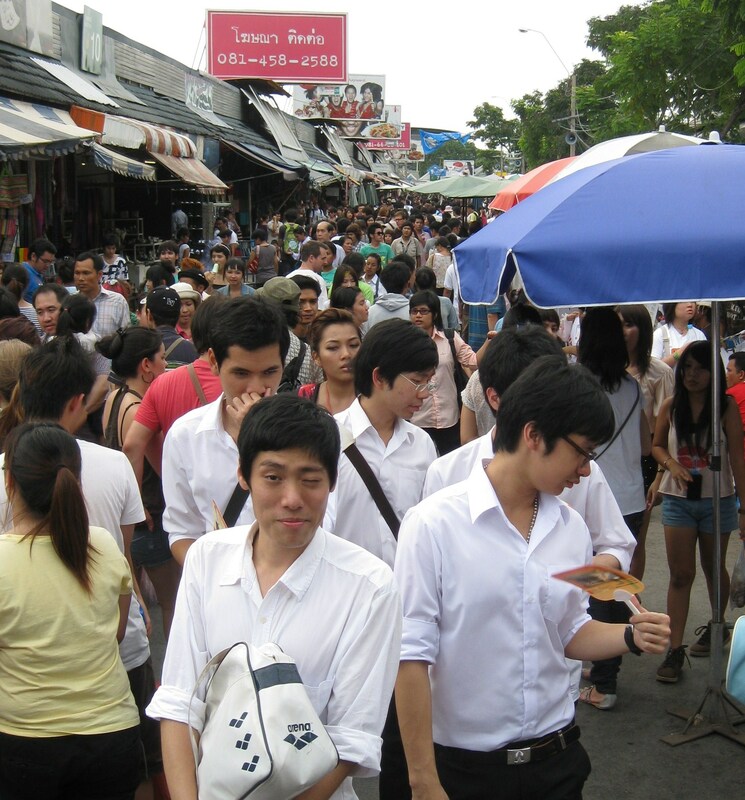 Markets are one of the few Thai places volunteers flock to. In America, I wanted nothing to do with Starbucks and shopping malls. Here, the Thais like to add a dash of coffee to their creamer and sugar and almost all restaurants are outside and lacking air conditioning. Because of this, I now love Starbucks and shopping malls and a good deal of the daytime hours are spent at them. I spent a recent weekend in Khon Kaen meeting with friends and meeting the new group who have only been at their sites for a few months. As of now, there are no volunteer weekends on the horizon, but where there are Peace Corps volunteers and a three-day weekend, there’s sure to be a get together. Twenty volunteers was a bit too much for this restaurant. Waiting for a burger in Khon Kaen. 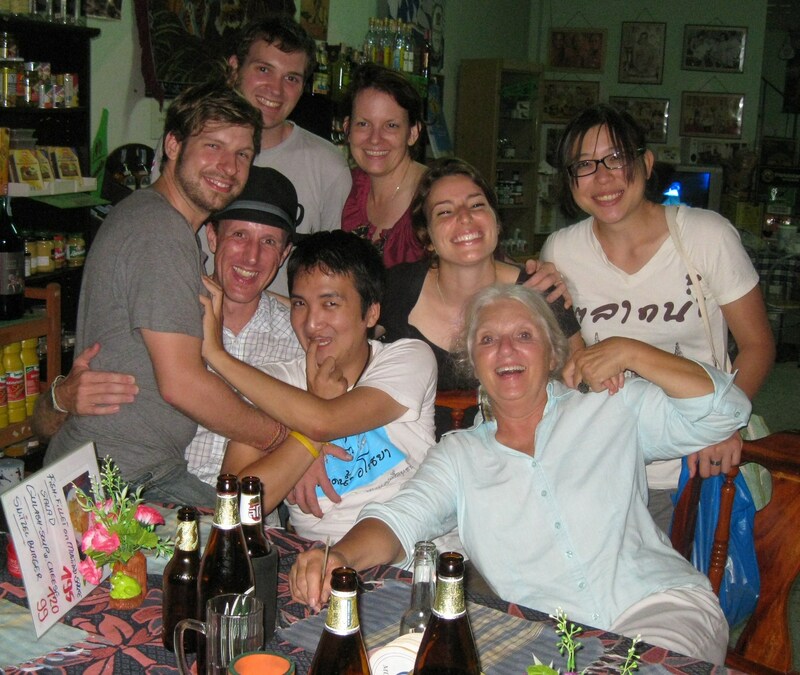 This entry was posted in Peace Corps and tagged friendship, peace corps, starbucks, thailand, traveling by Jeff Jackson. Bookmark the permalink.